Heat gas or charcoal grill. In small bowl, mix honey, lemon peel, lemon juice, 1/2 teaspoon of the salt, the thyme and 1/4 teaspoon of the pepper; set aside. 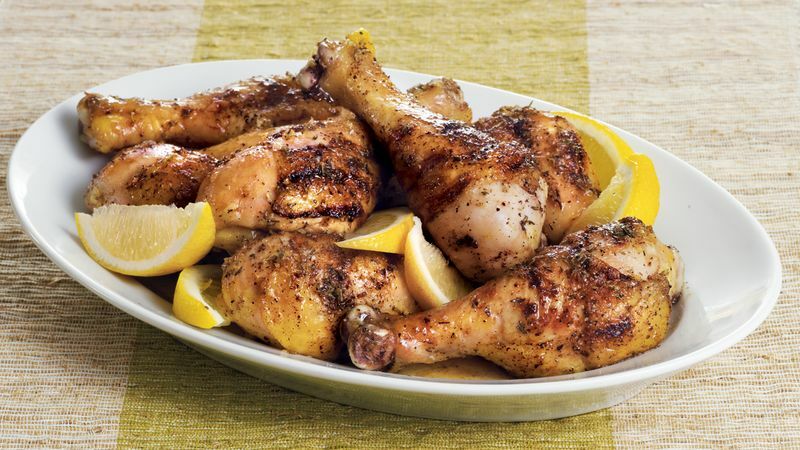 Sprinkle chicken legs with remaining 1/2 teaspoon salt and 1/4 teaspoon pepper. Place chicken on grill over medium heat. Cover grill; cook 16 to 20 minutes, turning once, until juice of chicken is clear when thickest part is cut to bone (at least 165°F). Brush chicken legs generously with lemon-honey sauce, turning to coat evenly. Cover grill; cook 1 to 2 minutes longer on each side or until glaze is hot and bubbly. Place chicken on serving platter. Garnish with lemon wedges. The lemon-honey sauce would also be great on other chicken pieces. Prepare as directed, adjusting the grilling time as needed; grill smaller pieces 10 to 15 minutes and larger pieces 20 to 40 minutes. Check doneness with a meat thermometer inserted into the center of the meat, not touching bone; when done, it should read at least 165°F. Be sure to grill the chicken until it is completely cooked before brushing with the sauce.